The Story of The Blue Planet by Andri Snaer Magnason is a different type of chapter book. It is the story of a village of children who have been children for more years than they can count, and who eat, sleep and play when they want, make all their own decisions, and answer only to themselves. These children admire the beauty of nature, like quiet sunsets and the annual awakening of the butterflies, and they kill only when necessary, like when they must kill baby seals for food. Life is natural and good until the day a stranger—aptly named Jolly-Goodday—lands on their planet and points out all the wonderful things that are missing from their mundane lives. He shows them how to use powder from butterfly wings to fly through the air, and when they discover the powder only works in direct sunlight, he demonstrates how to drive a nail into the sun to hold it in place so it never sets. In return for his “generosity,” the children pay him with the only currency they have: They offer a tiny portion of their youth. Now the children do nothing except fly in eternal sunshine until the day two of them get lost on the other side of the planet. There they encounter a cold and dark world with dwindling resources, and a band of starving children who cannot figure out where the sun has gone. Suddenly the two children from the sunny side of the planet realize that they must share their resources or the children from the dark side will perish. The problem is, they cannot quite convince the other children from the sunny side that the dark children deserve to partake of the earth’s goodness too. 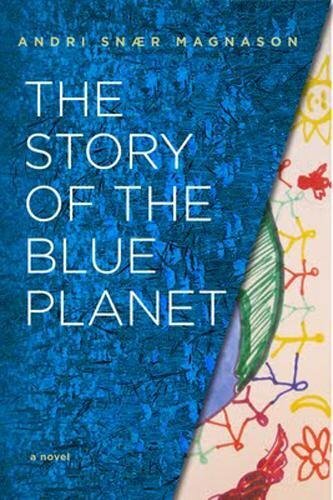 The Story of the Blue Planet is a thought-provoking story of an emerging society reminiscent of the one in The Lord of the Flies. The only difference is in The Lord of the Flies the island was peaceful until the adults disappeared, and in this book, the land is peaceful until an adult shows up. Like the children in The Lord of the Flies, these sunny children are not evil. It is only when Jolly-Goodday—who believes in a good time no matter the cost -- shows up that their thinking changes. He argues that since they are the first to come up with ideas like nailing the sun to the sky, they are entitled to charge other children who wish to share the resources. He also convinces them that they can ease any guilt they might experience by offering the deprived children their old clothing, half-eaten food, and other cast off items. The illustrations by Aslang Jonsdottir have an exotic feel, the perfect ingredient for this hauntingly familiar storyline about how the best things in life are free—and are for everyone. This poignant book with its exotic illustrations can be used across several educational landscapes. It might do well as supplemental or advanced independent reading, or it might even be used to open dialogue in social studies, citizenship, human rights, or ethics classes.